See the full 90 second preview during Sunday's pregame show! Yes, I know, it's a preview of a preview. But it looks super cool, doesn't it?! To participate in The Lone Ranger “Who Will You Ride With on Game Day” Sweepstakes* and get a chance to win prizes for “You and Your Kemosabe,” tune in and follow @LoneRanger on Twitter. For a chance to win, after the sneak peek airs answer trivia questions about the spot correctly and use #LONERANGER in the reply. All correct entries will be entered in a blind drawing for a chance to win a prize pack, such as Kawasaki helmets, SUBWAY® gift cards, and more. Each prize pack includes two prizes, one each for “You and Your Kemosabe.” The sweepstakes will end February 4, 2013, at 3:00 p.m. PST. For official rules: https://www.facebook.com/notes/the-lone-ranger/the-lone-ranger-who-will-you-ride-with-on-game-day-sweepstakes-rules/10151431178693373. 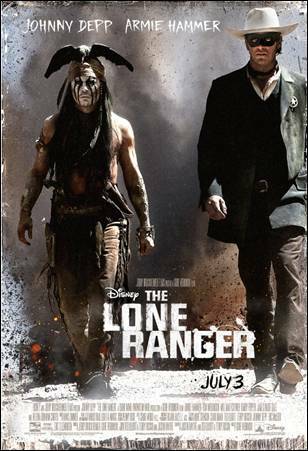 The Lone Ranger hits screens on July 3rd.